First, go to your desktop and right click on the My Computer icon. From the drop-down menu select Manage. In the Computer Management window go to System Tools -> Device Manager. If UAC is turned on, you will need to make some additional confirmations in order to access the list of devices. Now you will need to go to the View menu and select Show hidden devices. 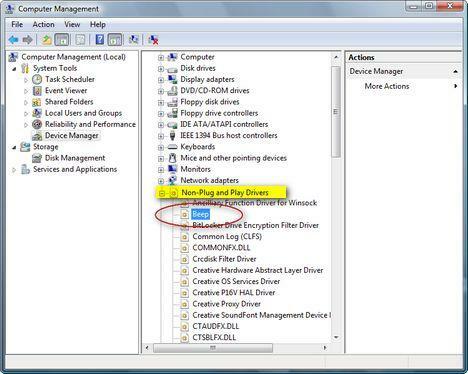 If you return to the Device Manager you will see a category of devices called Non-Plug and Play Drivers. Expand that list and select the Beep, as shown in the screenshot below. Right click on the Beep and select Properties. 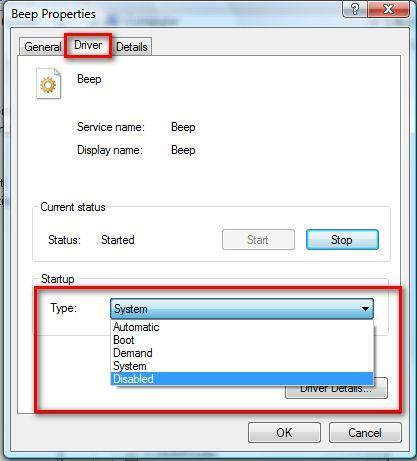 In the Beep Properties window go to the Driver tab. From the Startup scroll down list, select Disabled and press OK.
At the next restart, the Windows Vista System Beep will be disabled. Thanks for posting this. It's exactly what I was looking for, although you might want to add that the user needs to restart their system for the change to actually take affect. 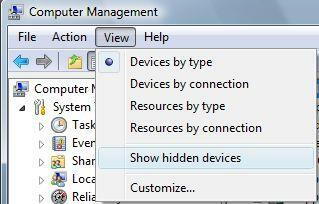 I have Vista Business and that option is not in the device manager, i can't turn the godamn beep off, any ideas?? PS: I already check show hidden devices, but not beep there, everything else but beep. Mine worked after I clicked Stop and then disabled. Here's what I did to solve that problem. I just stumbled on it because I forgot what I did and had to do this again for another computer. In Control Panel>Hardware and Sound, click on "Change system sounds"
In the menu under the "Windows" header, find Select. I created a short wav file with less than a second of no sound, called it "No Sound.wav" and put it into the C:\Windows\Media folder. In the drop down box below the menu, I have No Sound selected and hit apply. 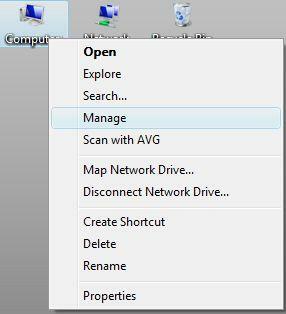 This could be another option if you aren't able to change/see the "Beep" selection in Computer Management. I have tried all 5 methods I've found on the web. Command prompt, Registry edit, Device Manager, ect. NOTHING would stop the beeping on my vista PC. This did the trick. Thank you so much. Open a command window by clicking on START then RUN then type in CMD. Press . At the command window prompt, type each line EXACTLY as written below and be sure to press ENTER [ENTER] after each line. NOTE: The space between "start=" and "disabled" is required. These two lines will disable the beep right away and it will not return unless you specifically enable it. If you wish to disable the speaker only temporarily until the next reboot, just type in the second line. Thanks for posting the commands. When I executed it on my laptop running Vista Operating System it disabled the beeping sound. I have tried all solutions posted! The device manager route doesnt work, even when i restart. It shows stopped but still beeps! The run command route doesnt work either, it says access denied. This beep is driving me mental! Vista Beep Ruining my Ears!!! I tried using the CMD prompt and it wouldn't even allow the commands to be entered. Please for the love of God, help me with this problem. I know when I am adjusting volume, and tapping the buttons on my laptop; I don't need the awful beep to 'alert' me of this, thus hurting my ears in the process. man, I have been searching for a solution like this forever. whenever I RDP into a work server that damn beep sounds off. It's particularly annoying when I've got my laptop in bed and my wife is asleep. I've tried disabling other sound-related things and finally this is the answer. I applied the net stop beep service solution above at the command prompt (DOS window for us old dudes). Thanks for posting this and god bless the internet(s). thank you, the beep's gone. I don't understand it. I did exactly as said and have check it again and the beep is disabled but still it beeps every time I select some things. How can this happen? I tried the command prompt commands and it errored saying beep was disabled! It seems like some others have had no luck but there has been no response to their questions. You might have disabled the beep but you still use the Windows Vista sound scheme. Disable that as well from the Control Panel. Ciprian, thank you so much! Ciprian, thank you so much! That's the only thing that worked for me (changing the sound scheme to no sound). The volume beep is gone too! Thank you! I hope someone fires the guy that decided to default the beep to be "on" but then hide the "off" button. Just go to sounds from desktop settings and set the sound setting to windows defaut. This is the least damaging way to get rid of beeps on vista. 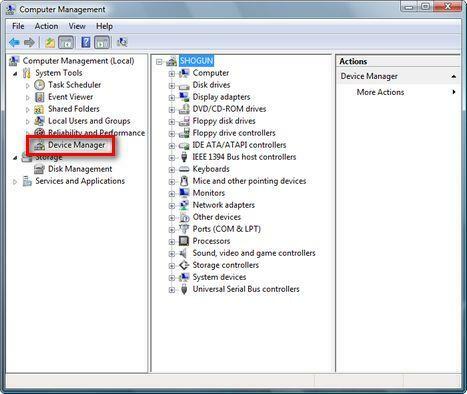 Hey, I also couldnt see that "Beep" in the device manager, but what I saw was there was a Ding.waw attached to something like "Default Beeping" (I am not sure beeping or beep since I am not using Vista in English) I just turned it to "None" setting and found the simple solution right before my eyes. Sometimes simple things may take long since you have your mind confused I guess. What i did was to take sound settings to "Default" , find Default Beep, switch it to "none"
this worked for me very well on my vista ultimate. I was looking for this since long.. Unfortunately, I have tried all of the above procedures and advise, step by step, and nothing has worked. First, I disabled the beep, and then I went to Sounds and set sounds to NONE. When I do that, it is even worse...a loud horn sounds every time I click on an email. I made an error of Uninstalling the beep...which didnt stop the anoying noise! after i had done this i came across this page and can see how to do it now, but cant because its not there anymore lol. i dont know wat to do. Help would be very appreciated. I opened up the device manager, right clicked on 'beep' and chose to uninstall it, this didnt turn off the beep. so it still makes the noise, but the 'beep' is gone from the devices and now i dont know wat to to. I tried this method and didn't get the beep I wanted to go away. So went to the sounds and started testing all the beeps till I found the one that was annoying me. It turned out to be my pop up blocker beep. To fix this I went to tools on my Google toolbar, then options then edit Pop-Up-Blocker, uncheck the play sounds box. Finally. I've been using a friend's laptop until I'm able to get my own, and whenever I backspaced too far in an IM program, I always got that bloody blood-curdling beep, and even on mute I would still get it (Which lead me to say it's the internal system beep). Was hoping to find an easy way to find a fix. Thank you for finding this and having an easy step-by-step method to go about it. Now I'll know how to fix it whenever I get my own computer and run into this problem. Now if there was a way to actually fix the folder bug in Vista... I'll be truly happy. As the two different registry hacks I've tried have failed (and both of them were the BagMRU hacks, and neither one worked). I'm no longer able to open up folders in the same window, no matter what I do. I have theorized along with someone else I found to have the same problem, that it has to do with "Open" and "Explore". If someone could find a registry hack to switch the values around for those, I may have an actual fix. If anyone can lead me the right direction, I would seriously be a very happy camper. Oh, and to think that this bug was caused after installing some of the updates for Vista. Removed them since it was all kinds of screwed up, causing Pidgin to no longer run, along with some other programs I have on here, and with them causing this bug to pop up. Everything else is back to normal, minus the folder issue. an easier way to kill the beep is just to assign a silent .wav to the "select" feature in the sounds menu. i used wmapro.wav which was in my list already. Well now that I finally have my own computer (I was the one who posted that insanely long post a few months ago), I was able to find this same site to remember the steps to get rid of this annoying beep. Works like a charm, and as posted before, it doesn't require a restart if you click the "Stop" button. This will then reopen the Beep Properties and you should have a populated Type dropdown, from where you can select "Disabled". Thanks for this, blissful silence, been trying for years to kill the beep!